After the grandiose announcement of my latest piece of insanity I feel that I should perhaps expand upon the rationale and thought process behind the whole idea and where it sits in the grand scheme of things. I should begin by stating that this was emphatically no idle whim and I was certainly not joking when I say that such an undertaking - a 54mm set up - has in fact been on the cards, in one way or another, for a number of years. I have given very careful consideration to the potential for expansion of the idea in respect of additional forces etc and how this would be realised over time. There are a number of possibilities in mind behind what would appear to be a purely Colonial style set up and so I will touch on them so you can see where my thoughts will be leading me in due course. Of course the North West Frontier and beyond was the setting for the 'Great Game' as Russian expansion in Asia pushed ever closer to British India. Russian troops fought the Afghans at the Battle of Murghab in 1885 and the subsequent diplomatic wrangling very nearly led to war between Russia and Great Britain. It would not be too far a stretch of the imagination to escalate this into a plausible war game scenario or campaign setting and I fully intend doing so in due course. I bet you didn't see that one coming! I was delighted when I discovered that as a result of Turkey going to war with Greece in 1897 the Sultan was so incensed with the attitude of the British government over their condemnation of the Ottoman position that he sent agents to stir up the tribes on the North West Frontier (as co-religionists) to give the British something to think about in return. At the time the frontier was like a powder keg anyway due to various 'Mad Mullahs' doing the rounds so Turkish encouragement was hardly necessary but was there all the same. One of the rumours in circulation was that Turkish troops had captured the Suez canal and were currently engaged in clearing the British from Aden and such like! Again, this would allow the appearance of Ottoman troops - not necessarily on the frontier itself but perhaps as an Aden invasion force. Of course both Russia and Turkey could engage in their own private squabble quite independently of the British India and so I am quite sure you can see the potential. The Afghan tribesman could easily be used as friends or foes for each of the forces mentioned and both Russia and Turkey could easily morph into Rusland and Fezia as and when the need arises. It also means that I will have a naval perspective as ultimately Russia, Turkey and Great Britain will need fleets - for use in the Black Sea in the case of Russia and Turkey or the Persian Gulf/Red Sea/Indian Ocean for Great Britain and Turkey. I think it is safe to say that the above would easily provide more than enough entertainment value for several years worth of gaming and so this is very much a long haul project but, even a journey of a thousand miles starts with a single step and so far I have only just opened the front door! I blame the Carry On team, Winston Churchill, Flashman and Kenneth More. The idea of war gaming the constant and unending struggle on the North West frontier of India has long been a guilty pleasure of mine but, like so many things, I never really tackled the concept other than to amass a small section of the library devoted to it. Spreading the idea further the whole Indian sub-continent has exercised a seductive allure from a military history perspective - from the time Alexander the Great up to the 18th century with Clive and beyond. The 'Jewel in the Crown' was aptly named and the potential for games set in the later years of the 19th century is both many and varied - from small scale skirmishes up to and including full scale battles and campaigns. So what does all this mean then? I have gone and done something that is not 'rather rash' - rather it has been an idea being mulled for probably at least the past 5 years to my knowledge - probably even longer if truth be told - and has been touched upon in the blog on a couple of previous occasions. My adventures with 15mm have come to an end. I am sorry for this but I just cannot get on with then no matter how hard I try they just do not hit the spot for me in any way, shape or form. Were I to tackle anything in a smaller scale it would have to be 20mm as I suppose I am a little bit of a traditionalist in that respect and I indulged in painted armies in that scale long before 15mm, 25mm or 28mm. I have also painted and converted a number of plastic 54mm figures for use with Western Gunfights; albeit many years ago. I have acquired a modest selection of Armies in Plastic 54mm North West Frontier figures with a view to raising two forces - one Afghan and one Imperial - for use with a number of hex based systems, skirmishes and also Funny Little Wars. The action will focus on events in the little known Roghan Valley where the Imperial garrison at Dovecot attempt to maintain control of the area from the depredations of the fearsome Jalfrezis under their renowned leader Shere Khanaj and his chief advisor the self-styled Prophet Abul. Ships may only launch a single torpedo attack per turn - no salvo firing. In this period and as far as I have been able to deduce it was not standard practise to loose off every torpedo carried at once - 'volley firing' of torpedoes came much later. The dice roll to hits stays the same at 4, 5 and 6 BUT if the target is firing on the attacker during the second attack phase then the chance to hit is reduced to a 6. This allows for the effect that the deluge of incoming fire will have on the accuracy of the attacking ship. The target ship, if a Battleship or Cruiser, is allowed one single point 'turn away' from the direction of a single attack which is declared after the attacker announces their target. The torpedo is fired and crossed off but to no effect BUT the evading ship may not fire heavy or medium guns during the following first attack phase. The rationale behind this is that the gunnery aiming would be thrown off by the violent change of course needed in order to avoid the incoming torpedo. Of the three points listed the last one - the 'turn away' - is a mechanic I have unashamedly borrowed from James Dunnigan's Jutland game produced by Avalon Hill many years ago. The plan is to test this lot at the club on March 7th although I may run them solo over next weekend. Assuming all is well (and I have no reason to suppose otherwise) then this will be the definitive 'tweak' to the rules - in which I have now also included dreadnoughts. The two fleets deployed with the Greeks in the foreground (the coloured spots are for identification purposes as the models are currently unpainted). Following on from the first 'live' test of the MoBaS rules at the club last Wednesday evening I decided to fight a similar action using the same forces but with the rules having incorporated a couple of minor revisions. One of the problems arising from Wednesday was the simple fact that combat was fairly inconclusive and I cannot recall ever taking part in a naval game that finished up with only a single ship having been sunk from the sixteen on the table! Oddly enough, whilst the results felt historically accurate it did make for a relatively 'muted' game. A couple of changes later and finally tweaked rules were ready to go - and with some dramatic results! The Greek navy, despite being smaller than the Turkish, has thus far managed to not only hold its own in the fight against the Ottomans but has in fact largely achieved a measure of superiority in the area of operations. The Turks have been active in the Black Sea but have all but surrendered the initiative to the Greeks in the Aegean Sea and have kept safely out of harms way and protected by the minefields and shore batteries at the entrance to the Dardanelles. However, stung into action by public outcry (and desperately attempting to relieve the pressure on the hard-pressed army) the Turkish Navy is at last sallying forth with the intention of bringing the Greeks to battle. The Greek navy had managed to achieve local superiority over the Turks by bold ship handling and resolution and whilst defeating the Ottoman navy in a straight fight would be the crowning glory of their war at sea it was not a set of circumstances that would be easy to engineer. A routine sweep near the entrance of the Dardanelles may tempt the reluctant Turks out to battle but this was fraught with danger as the ships of the Greek navy were considerably outgunned by the enemy. The Greek navy consisted of the armoured cruiser Georgios Averoff, three coastal defence battleships - Hydra, Psara and Spetsai and four destroyers - Niki, Doza, Aspis and Velos whilst the Turks that sallied forth to engage them consisted of the battleships Hayreddin Barbarossa, Torgud Reis and Mesudiye, the protected cruiser Hamidiye and four destroyers - Basra, Yarhisar, Samsun and Tasoz. The two sides had adopted virtually identical sailing formations with the respective cruisers in the van and the four destroyers operating in line ahead on the starboard beam of their battle line for the Greeks and the port for the Turks. Upon sighting the enemy formation (at around 20,000 yards) the two sides adopted broadly similar dispositions with each cruiser speeding ahead in order secure a tactical advantage. As the two cruisers swung into position to engage one another so the following battle lines followed suit. Initially the Greek navy was in a better position to open fire and so the Averoff and the Hydra, Spetsai and Psara all concentrated upon the only target in range - the cruiser Hamidiye - with telling effect. (The resulting fire inflicted some two points of damage - the hull was hit and the torpedo rack destroyed.) The Averoff was not so fortunate as whilst only two of the Turkish ships were in range they were the 11" gun armed Hayreddin Barbarossa and her sister ship, the Torgud Reis - and the luckless cruiser duly received three hits. Meanwhile, the two destroyer screens had sped ahead of their respective charges and were about to become involved in their own private battle. The opening salvoes as both the Turkish Hamidiye and the Greek Averoff take hits. Note the destroyers heading off for their own private war. The destroyer melee resulted in a number of hits being scored on both sides but the most significant feature was that whilst the Greek destroyers fell in with the Averoff - in order to protect the ship from the marauding Turks; was that in doing so, the four ships were separated from the slower and more vulnerable battleships. The manoeuvres by the Greek destroyers were carried out briskly and efficiently and meant that the flagship was completely protected from the Turks who suddenly found themselves in a position where they could no longer easily reach the Averoff but, were then virtually crossing the head of the Greek battle line. The results proved to be catastrophic. The Turkish destroyers, although slightly knocked about by their opposite numbers, immediately disengaged from the attack on the Averoff and concentrated on the lead Greek Battleship with two of their number. At point blank range torpedoes sped from their tubes and the result was sadly inevitable. (Of the 9 dice rolled for the attack only 4 hit home but two of these were 6s and so eight points of damage were scored. The luckless Greek battleship, the Hydra, had a flotation value of 6 and a speed of 2 and was sunk outright.) With one large explosion and a mass of smaller secondary blasts the Hydra slipped beneath the waves. Too late the Greek admiral attempted to rectify the parlous position his battleships now found themselves in. Unfortunately, whilst the destroyer melee and the subsequent attack on the Greek line had been undertaken the Turkish battleships, with the damaged Hamidiye bringing up the rear, had moved up in order to engage the Greek ships and were in the process of completing the manoeuvre when the Greek destroyers attacked. It was too little, and too late. The Greek attack fell on the Mesudiye and the Hamidiye as they were the nearest. Despite the fearsome amount of fire the Mesudiye was able to put down only a few hits were scored and the Hamidiye did not manage even a single hit. 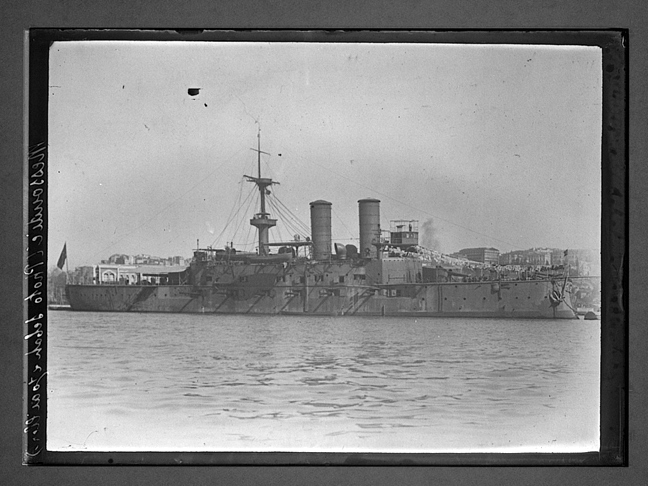 the Greek torpedoes left their tubes and the results were heavy damage on the Hamidiye and some on the Turkish battleship but both vessels were able to maintain their place in the line, albeit with their speeds reduced. Luck had favoured the Turks in this instant and was about to take a much more impressive hand in things as the remaining Turkish destroyers (those that still carried torpedoes) engaged the other two Greek battleships. Again at point blank range (and thanks to a combination of winning the initiative for the turn and some deft manoeuvring) the Turks engaged the Greeks with the same results. The rear Greek battleship - the Spetsai - and the vessel - the Psara - were both torpedoed and sunk. (the Psara sustained no less than 14 points of damage due to a succession of 6s being rolled!). At this point the Greeks cruiser the Averoff recalled her destroyers and the battered survivors disengaged. Mindful of the damage to both the Hamidiye and the Mesudiye the Turkish admiral remained on the scene and picked up the survivors from the Greek battleships. It had been a stunning victory. The rules were far more decisive than the previous version and although the torpedo attacks were spectacular the effect was about right. I think that it is a little too easy to score a hit with them though - especially when under fire so I may give this some further thought - perhaps reducing the hit chance if under fire but leaving the damage effect as is. Once again, it was great fun and a pleasant way to spend an evening. "I love the smell of new books in the morning....they smell of....new books!" For a variety of reasons it has been a fairly busy couple of weeks - mainly to do with my efforts to secure a new job for when my existing contract comes to an end on Friday of next week. So far I have had little success but there are a few possibilities on the horizon and so I am sure that something will turn up in due course. In the meantime though it has mean lots of phone calls, interviews with agencies and hundreds of emails! I have not been entirely idle though on the shopping front and so a couple of choice items have crossed the threshold prior to my enforced economy drive. I will detail one of these in a later post but for the time being I was delighted to get home this evening to the book illustrated above - Battle on the Seven Seas: German Cruiser Battles 1914 - 1918 by Gary Staff (ISBN 978-1-84884-182-6) and published by Pen and Sword. The major German cruiser actions of WW1 need little introduction but the beauty of this book is not only that they are all under one cover but also the author makes much use of German sources for the accounts. His descriptions of the various actions of the Goeben in the Black Sea gives some telling evidence of the state of the Turkish Navy and highlights in very clear detail the problems faced by the Germans. Aside from the usual Coronel, Falklands, Emden and Konigsberg stories there are also accounts of the action off Ostergarn in 1915. I had planned to visit the Navwar shop last weekend with the view to acquiring a selection of 1/3000th scale cruisers in order to replicate the actions mentioned and to set up some mini campaigns based around the old naval standby of 'Hunting the Raider'. Sadly this may have to postponed for a while but I still have sufficient models to cover the Black Sea if nothing else - and I have just about added the rules for dreadnoughts to MoBaS! The Turkish battleship - Mesudiye, the scourge of the Greek Destroyers! Yesterday evening saw the inaugural game of MoBaS 1890 to 1905 in the public domain - at my war games club; SEEMS (South East Essex Military Society). I was very fortunate to be able to enlist the help of Messrs. Fox and Fosker whom accepted the roles of the commanders of the Turkish and Greek navies respectively. The action was fought with the unpainted Minifigs ships (shock, horror!) on my Hexon tiles. The forces were identical in composition and consisted of a cruiser, three battleships and four destroyers a side. Sadly I forgot to take a camera so there are no pictures but I am planning to run the action again as a solo game over the weekend with the usual after action report so they will feature then. Very briefly the action developed with a furious destroyer melee between the fleets during which the under-gunned Greek destroyers certainly gave better than they received - there were certainly some extremes of dice rolled by either side! The Turks were able to get their supporting battle line to close up on the destroyer melee and in doing so managed to inflict some severe punishment on the Greeks with salvos of light and quick-firing guns and this redressed the balance somewhat. The Greek cruiser Georgios Averoff received some heavy shell hits and stopped a torpedo and so whilst heavily damaged was able to disengage at the end of the action as the Greek fleet was deemed to have 'lost on points'. The Turkish cruiser, the Hamidiye was riven with shot and torpedoed but was still afloat, albeit only just when the fighting stopped. Incredibly, despite many hits being scored by both sides only a single ship was actually sunk during the game - one of the Greek destroyers that found itself parked more or less in front of best part of the Turkish battle line. I apologise the 'highlights' nature of this post; the main point is mainly to record a few observations with the rules which came out of the test and so a detailed after action report will follow after my planned re-fight. Movement and combat worked very nicely although I will need to clarify the rules for stacking a little more - especially for combinations of ship types or even sides occupying the same hex. Line of sight needs some attention and Mr Fox came up with the suggestion of reducing gunfire by a gun letter per ship in an intervening hex which makes a lot of sense and I may well introduce this - also for torpedo attacks. I also want to simplify the actual hit numbers involved for gunfire as at present it is a little clunky and I am thinking that having qualifying hits, whilst making for, in my opinion, a more historically accurate depiction of gunfire effect over a period of time it does make for a less decisive outcome. The action felt right in respect of the damage from gunfire but it was a long process and my fear is that for a larger action it would lead to indecisive results. I need to give this thought but certainly the system for gunnery works a treat so that will stay as it is. Torpedo attacks felt right although I am thinking that they do not do enough damage at present and so may well revise this. I suppose to sum this post up the rules can best be described as a 'work in progress' although I am extremely pleased with the results thus far. The concept has been proven and so it will only remain for me to take the final steps mentioned above and then 'job done'. My grateful thanks to both Mr Fox and Mr Fosker for a very enjoyable and thought provoking evening and I promise faithfully that the next time we use the rules Mr Fox can use his own dice....(he didn't like mine very much!). The link above should enable you to download the latest version of the rules I have been experimenting with. Please feel free to do so and let me know how you get on with them. I plan to upload some ship specific charts which can be used instead of the generic versions in the rules - starting with the Greek and Turkish fleets and then the Russians for the Black Sea. Following on from earlier 'Action at Sea' post I decided to run another action as a follow on. This was not my original intention - I had planned to tackle something a little larger and lot more Balkan - but the idea seemed like such a good one I thought I would go with this instead! Once again the rule in use are my version of MoBaS - Memoir of Battle at Sea - and apologies for the fact that the models are still unpainted! I have a very good excuse for this oversight as these models will hopefully be used as masters for when I can get them moulded and cast so being painted would be a distinct disadvantage. Unfortunately the pictures did not come out particularly well and so I will have to rely on the power of description. Following the successful sweep of Blue's territory by the Red Lord Nelson type battleship the naval high command decided to send her out again but this time accompanied by an armoured cruiser for support. Once these two vessels had managed to breakout into the open sea past the Blue patrols they would be handily placed to attack the convoy routes and cause much damage to the vulnerable supply lines. Unbeknownst to Red, the Blue naval high command had gotten wind of this breakout and so deployed their forces in a wide net and with hopefully sufficient force to both find and engage successfully the enemy force. Fortunately for Red they managed to raise steam and sail through some unseasonably bad weather - rain squalls and very poor visibility - and so were able to elude the Blue patrol lines. They did not have all their own way though as a chance sighting by a neutral fishing boat was relayed to the Blue naval high command and the closest ships along the enemy course were immediately ordered to find and sink the enemy raiders. Speed 2, Flotation Value 10, Heavy Guns A, Medium Guns E, Quick-firing Guns M and one torpedo attack. Speed 3, Flotation Value 7, Medium Guns G, Light Guns I, Quick-firing Guns M and one torpedo attack. Speed 2, Flotation Value 9, Heavy Guns A, Medium Guns G, Light Guns I, Quick-firing Guns M and one torpedo attack. Speed 3, Flotation Value 8, Medium Guns E (times 2), Quick-firing Guns M and one torpedo attack. Turn 1 When both sides spotting one another simultaneously the opening moves were perhaps largely predictable. The Red force attempted to use their cruiser to head off the approaching Blue ships. As both sides have a 'fast' ship very quickly these left their slower charges in their wake. The turn concluded with no firing from either side as the range was too great although this would not remain the case for very long. Turn 2 As the two sides continued to close the first shots were exchanged between the main heavy units of either side; with first blood going to the Red flagship as she managed to hit her opposite number at extreme range with her opening salvo. The damage was recorded against the Blue battleship's Flotation Value. Meanwhile, the race to secure an advantageous firing position continued as both sides attempted to reduce the range. The end of turn 2 - the lead Blue ship is now some distance ahead of her flagship whilst the Red cruiser, by dint of some adroit seamanship, is screening her own. Turn 3 With both sides now in range (remember that Heavy and Medium guns fire once per turn at the start of the turn - before movement) fire was exchanged between the two flagships although with no effect. The Red cruiser managed to score a hit against the second Blue battleship for no reply although the forest of near missing shell splashes she received for her temerity (the Blue battleship rolled a pair of 5s) was perhaps a warning of things to come. The hit on the Blue ship was taken against the Flotation Value. Turn 4 Again the range came down but gunfire from all vessels was singularly ineffective with the exception of the single hit scored by the Blue flagship against her opposite number and once again, this was taken against the Flotation value of the target. Turn 5 What the previous turns lacked in urgency were more than compensated for by the opening salvos of turn 5 as the Red cruiser opened fire at the leading Battleship scoring hits with both her medium and light guns (incorrectly recorded as four damage points rather than three - obviously the heat of the action interfered with the umpirical thought processes!). It was to be a short-lived success however as both the Blue battleships opened fire on the luckless cruiser scoring a total of 7 points of damage! The furious exchange of gunfire at the start of turn 5 - the white markers are pegs from the game Mastermind but whatever they are, the Red cruiser is the unlucky recipient of far too many of them! This was suddenly very serious for the Red fleet as the cruiser was not designed to take that kind of punishment. The hits were taken by the Blue battleship across a variety of locations whilst the poor shot riddled cruiser had to take hits from everything including, critically, her speed which was reduced to two. Battered, and with smoke pouring from the deep gashes in her hull she attempted to limp away to safety. Unfortunately, sensing blood, her opponent, now with a speed advantage despite having taken some gun damage (both sets of medium guns had been reduced by a letter from E to F), closed in for the kill whilst her flagship maintained a wary eye on her opposite number. Turn 6 If the Red fleet cruiser was feeling poorly after turn 5 then things were about get a whole lot worse as her tormentor let fly at virtually point blank range to score a further 5 points of damage for no reply. The cruiser was all but finished but, in the spirit of defiance, her flagship rose magnificently to the occasion and scored 3 hits against the Blue flagship despite receiving but a single hit in return. Still the cruiser attempted to escape whilst her flagship swung her helm over to come to her rescue. Only time would tell if she was too late in her attempt. Turn 7 A lull settled over the scene as the Blue battleship continued to circle her gravely wounded adversary whilst her flagship continued to maintain a watching brief in order to keep the Red flagship at a safe distance. A few random salvos rang out but to no effect as both sides, with one accord, paused to draw breath in readiness for the climax of the action. Turn 8 The Red flagship swung her helm over yet again and engaged the Blue battleship currently picking over the corpse of the cruiser. A couple of hits added to her discomfiture but they were the only hits scored by either side. Still the battered cruiser limped painfully away. (From this point the pictures are of very poor quality and so I am unable to add any further shots - apologies to all but I am sure you can visualise the scene). Turn 9 Clinging on to her prey but mindful of the looming bulk of the Red flagship bearing down on her, the Blue battleship managed to score a further two hits on the wreck of the enemy cruiser which, despite the horrendous battering she had received was still afloat and still mobile. Turn 10 Seeing an opportunity the Blue flagship switched targets from the Red flagship to the cruiser and added a hit of her own. Not to be outdone, the second Blue battleship finally got her reward for her persistence as a final salvo inflicted a maximum of four hits from four dice (6, 6, 5 and 4) on the enemy cruiser and so the battered hulk, her ensign still flying, slipped slowly beneath the waves. The Red flagship was relatively unscathed and so was able to disengage from the scene of this disaster. The enthusiasm of the cruiser to get into action proved to be her undoing as she was not equipped to fight it out with a battleship - especially designed to fight commerce raiding cruisers. The Red flagship perhaps could have closed sooner but the fight was too far away and she was never going to be able to catch her speedier opponent especially as her opposite number, although not as effective, was dogging her every move. The only ship capable of catching the Red flagship after the cruiser had been sunk (Blue 2 - the Swiftsure class battleship) was quite heavily damaged and due to the short range of her guns would have needed to have gotten very close to her opponent to force a decision. Wisely she fell in with her flagship after picking up survivors from the cruiser and the two vessels headed back to base with the news of their victory. The stain of dishonour from the previous action had been removed. The game worked pretty well but did throw up a couple of points that I have incorporated into the latest version of the rules (which I will upload to the blog as soon as I have worked out how to!). I have now ruled that hits applied to weapons must be evenly distributed in order to avoid taking out the least effective weapon first. I have also changed the rules for turning. Now it costs nothing to turn one hex side per hex entered but a second or subsequent hex side costs a movement point. I have also taken the opportunity to further revise some of the grammar so that the rules read with greater clarity. It has been a fairly busy week one way or another - especially as I am now trying to chase down a new contract of employment when my existing one ends on March 2nd. Sadly this is the perennial lot of the contractor and so at present it looks as though I may well be having an impromptu holiday very soon! However, in order to shake off the doom and gloom I plan to run game number four over the weekend and plans are afoot for the same. It will be a naval action as although I have something rather special planned by way of a land action there are still a few angles that require attention and so this will have to take place at a later date. So, in the interests of convenience I shall be heading back to the high seas for a small naval action - featuring those old stalwarts, the Greeks and Turks. I shall be using the current version of Memoir of Battle at Sea (MoBaS) and with specific ship ratings rather than the generic version. I am also trying to work out haw to upload the PDF of the rules to the blog so that anybody can download a copy should they wish. As soon as I have worked out how to do this they will be freely available! Firstly, an apology. The number of blog posts over the recent week has dried up somewhat for one simple reason. I have been busy drafting an article for a couple of journals which has grown into two such articles with a third to finish off with! I have really enjoyed this but it has taken up rather more time than I thought it would. They are now complete - at least the first two are - and so I can now get back to more pressing matters. Trees - you know, those tall green and brown things. Sometime ago I waxed lyrically about the old range of trees that used to be produced by Merit and indeed, I have acquired some of the same. The only problem with them is that some of them are so old they are suffering from the dreaded brittle plastic syndrome that some old polythene models succumb too over time. I still wince at the fate that befell two battalions of painted Airfix Highlanders from my 1975 vintage 1815 Anglo Dutch army - with the exception of both units musicians some 56 figures all snapped off neatly at the ankles. It was enough to make you weep! Now that I have a supply of Merit trees I am unsure if I will use them going forward and so expect they will eventually be offloaded - sadly my fondness for them has been offset by the ravages of time. One thing I do have as a fall back position is a large number of the 'trees' supplied in the Torn in a Bag wooden play set. By no stretch of the imagination can these be described as beautifully detailed examples of model trees but they a number of advantages if used carefully. To begin with, they are to hand - which is an important consideration when facing pending unemployment (the usual contracting dilemma). They also have (and many thanks to Bob Cordery for this observation) a very small 'footprint' on the tabletop. I am sure that most gamers have at some point moved trees around to facilitate movement of a unit and (trees do get in the way - rather like in the real thing I guess!) then have replaced them perhaps not as they were originally deployed (I am not suggesting any nefarious practices here either - just elastic positioning!). Well, using a tree with a small base size will help to alleviate that problem and these models certainly have that. I will photograph them when completed but in a nutshell this is what I am currently working on. I have a supply of old style fibre rawl plugs which when cut into assorted lengths make very realistic looking tree trunks. These are glued to a 1p piece. A small hole is drilled into the underside of the Town in a Bag tree and piece of wire is then inserted and glued in the top of the rawl plug and the tree - to give a stronger join rather than just gluing the foliage onto the trunk. The 1p base is then coated with PVA and coated with sand. This is then varnished and the sanding is repeated. I will then paint the base an earth brown colour and apply some of the Hexon base green flock so that they match the tiles I have. the tree foliage will be covered in some fashion but I am unsure with what at this stage. I realise that all if the trees will be vaguely Poplar-ish but that is not a problem as I am willing to bet most gamers have used the wrong trees in the part of the world they are representing at some point. Simple and effective I hope and I should have the finished by the weekend time permitting. Arriving from the USA this morning was a book I have been after for some time and is a very useful addition to the library. The book in question is 'The Greek War of Independence' by David Brewer (published by The Overlook Press ISBN 10: 1585673951) and it covers the Greek struggle to throw off the Ottoman yoke from 1821 to 1833. The book is a detailed account of the war as a whole although not specifically a military history. The story of the Greek war cannot be described as one of a fine example of the military art but that is not to say it is not without interest from a gaming perspective. Small scale actions were very much the order of the day - on land and sea - with raids, sieges, inshore naval action and an interesting combination of ex Napoleonic 'officers' (usually a motley selection of self promoted adventurers, and assorted 'Hellenic admirers' (including Lord 'Mad, Bad and Dangerous to know' Byron and others matched up with a varied assortment of brigands and general ne'er do wells. Apparently Albanian mercenaries featured on both sides and the various international officers in service with the Greeks spent an inordinate amount of time fighting duels amongst themselves! The naval side is quite interesting - even before the battle of Navarino - as the Greeks were far better sailors than the Turks but used much smaller ships whilst the Ottoman navy had some very nice ships (including some French built 80 gunners) but were little short of abysmal in respect of seamanship. This is certainly a period to look at further as something a little different - imagine a horde of Greek outlaws with some virtually Napoleonic looking officers attached! This post should really be called 'Making a Silk Purse from a Sow's Ear' because that is pretty much what I have done! If you recall I discarded the entire bridge assembly from the Majestic as it was a badly cast lump. In fact, it looked as though one half was upside down when viewed from ahead. My plan was to make use of some Milliput to fashion a replacement and so this was duly acquired from Modelzone earlier today. I don't know why but I started to take another look at the offending bridge; mainly to see how the new one should look - and so I took a file to it to get a clearer view of the layout. You can probably guess the rest - after some judicious application of a file or two, blow me if the bridge miraculously turned into that which is was supposed to be! I am really pleased by this and I guess that the moral is just because something looks grim doesn't necessarily mean it is! This now means that the models I have are ready for phase two of the plan - the moulding and casting. Not a great deal to report as I have run out of Milliput - rather the Milliput I had was virtually fossilized due to old age! - for the bridge assembly so instead I spent a little time with the Majestic funnel mounting. It is rather small so I did not bother with a picture but it is now ready for use. The first thing I had to do was to make sure the two funnels were the same height which was easy enough with a few strokes of the file. Next, I had to trim the base so that it was level with the circumference of the two funnels - again easy enough with another couple of strokes of the file. The underside of the assembly (the part that is in contact with the hull) needed leveling so as to avoid leaning funnels and this was also easily rectified. Finally, and this was the trickiest part of the undertaking, I needed to remove the built up section at the base between the funnels. This took a couple of cuts and some very careful filing between the two funnels so as avoid any damage. It all worked out OK and the end result is a pair of funnels that now look taller despite being shorter - simply because the base 'clutter' has now been removed. The fixture can now be placed in either direction quite happily in the locating hole in the model's superstructure which means that once the bridge has been built (I shall be visiting ModelZone tomorrow for the Milliput) I shall have the basis for a large number of similar looking vessels. Work is underway on the restoration/renovation/refurbishment of my recently acquired Majestic class battleship and I have to say that thus far it is going pretty well. To begin with I was going to strip the paint but it game off with some firm rubbing with a scouring cloth which was handy - as well as saving time. I removed the offending bridge and masts but was delighted to see that the turrets did not need any work. The 'ring' around the base of the turrets was merely flash and it came off easily enough. The biggest problem was the fact that the paint was pretty thick and obscured a lot of the detail and this was what had covered the turret ring and made it look far worse than it was. Some strategic filing and the end result looked pretty encouraging. The biggest surprise though was when I had a light bulb moment with the funnels. On the model these were located via a hole in the top of the superstructure and the assembly, roughly in a 'Y' shape, just plugged in. I was looking at these and was just about to discard them (one of them was smaller than the other although not significantly so) when I popped it into the locating hole facing fore and aft rather than port and starboard - and it gave me an idea! Spot the difference - and the potential! By some judicious trimming of the edge of the funnel assembly it is possible to use the hull as either the original Majestic class or as any one of the following classes merely by orientating the funnels. You could even leave this assembly loose and rotate the funnels as needed - although that me be a little too left field for most gamers! The only remaining thing for me to tackle now is the new bridge assembly. Ordinarily I would just cobble one together using plastic card but given that this model is going into a 'proper' casting set up it needs to be strong enough to withstand the pressures associated with making a mould. This will mean Milliput. Arriving from the USA and generously donated by Steve Cady (of the blog 'Castles of Tin') is another model for my pre dreadnought 1/1800th scale collection - that of HMS Majestic. The plan is to clean her up and give her a little TLC so that she will be able to used as a suitable master for the moulding idea I am currently pursuing. She will need a little work to get her to this state and so that will be my focus for the next few days. Firstly, she will need to be stripped (Oooeer Missus!) back to the bare metal and then the real chopping up can commence. Firstly, the funnels will have to come off. Historically these were side by side but the model has them deployed like rugby posts (or American Football) being widely separated. Also, the bridge structure appears to be very lopsided with the 'wings' not matching up when viewed from ahead so I plan to hack this off and replace the same with a Miliput version. I will also remove the wire masts. Finally, the turrets have a very pronounced ring around the base - this looks like flash of some kind - which will need some attention. If that proves to be too difficult then I could always remove them and replace them with some others - I have a number of donor hulls set aside for this purpose. The end result will not have any masts and so these would need to be added later - togther with fighting tops etc. In fact, the keen modeller could make a very presentable model from one of these quite basic castings should they wish. I appreciate that this may all seem a lot of work for one model but the reason is quite simple. The hull and superstructure configuration of the Majestic class is about as close to being a generic looking pre dreadnought as you are likely to get so if I can pull this off the potential in terms of repeat castings is enormous. Being cast without funnels may seem odd but adding these from plastic or metal tube afterwards is very easy and also has the added attraction of not only being able to add as many as required but also placing them in whatever position is needed; thereby maximising the ship classes the basic hull could be use for. Having said that, once the existing funnels have been removed adding some new ones from Miliput or metal rod would not be too difficult so I may even consider that as an alternative - it will depend on the state of the hull. Once the basic hull has been refurbished and is ready to be cast then the real attraction of this model becomes apparent. For the Royal Navy alone the resultant casting could be used (as long as you are not overly offended by the lack of detail) for any of the battleship classes put into service up to the King Edward VII (I already have Swiftsure). Many foreign navies used a similar looking configuration although anything with a pronounced outward curve of the hull (the 'tumblehome' so beloved of the French and Russians) would not probably not be suitable. Should my modelling skills not be equal to the task then I have a 'Plan B' to fall back on - I will concede defeat and use the King Edward VII casting as my generic pre dreadnought battleship. Just think of the superstructure 9.2" guns (one on each corner) as being 6" guns on steroids! They actually look more like casemate types in any event and are also larger than the turret mounted 12" weapons so could be called whatever was desired - scale considerations and fine detail were never a major feature of this range of models! Once again then, I would like to extend a massive thank you to Steve Cady for his very kind donation and I hope that I shall be able to restore the same to something like its former glory and for future use - I hope to be able send him a newer version back across the Atlantic in due course! By way of a pleasant diversion (and a welcome surprise) I acquired a copy of 'Britain's Army in India - From its Origin to the Conquest of Bengal by James P. Lawford (ISBN 0 04 954020 3)' via Ebay for the princely sum of £2.80 (including postage)! The author needs no introduction (at least he shouldn't!) and the book covers the period up to the end of the Seven Years War. The period in question is really the story of the army of the East India Company and that of Clive of India. The machinations of the various Princes, the break up of the Mogul Empire, small forces of European infantry vying for favour and influence and facing enormous odds. The book contains maps, orbats, campaign and battle accounts as well biographies of some of the leading personalities of the period. This is the stuff that war gamers thrive on and given half a chance I would happily build up armies and navies for the campaigns of the 18th century on the Indian sub continent. Mike Kirby's special - believe it or not this was free! To support the above I had lurking in a forgotten corner of my collection a Miniature War Games special on the campaigns in India written by Mike Kirby. This is a very useful publication and is designed for use with the Volley and Bayonet rules written by Frank Chadwick - which is a favourite rule set of mine. I cannot realistically see myself ever tackling the armies for this period - the numbers would be too vast for one thing - so the prospect of emulating the exploits of Clive on the tabletop will sadly have to remain a tantalising one. Readers of the the blog will have no seen mention of the range of warships available for a short time from Minifigs at the back end of the 1960s and early 1970s. Through various means I have been able to acquire a modest collection of these models and the plan is to either drop cast some more copies or to approach a manufacturer with a view to having the models professionally moulded and cast and available once again for battle on the table tops (or even floors!) of the world. Negotiations for this are underway and I will post on the blog if and when this comes to fruition. In the meantime though, I thought it would be a good idea to illustrate the models I do have and then you will be able to judge for yourselves if this idea is a viable one. I am certainly very excited about the prospect of seeing these models back in production but I fully appreciate that they will not all things to all men! Minifigs Number 1 or a mysterious B4 - the number on the stern. Lord Nelson and 76mm long. The first model is of a Lord Nelson class Battleship and was numbered as number 1 on the Minifigs list I have. However, the model depicted is both hollow and die cast unlike the Minifigs version which is a solid casting - I have one of each. The die cast version came from the same source as the Swiftsure below. Minifigs Number 2 or a mysterious B2 - the number on the stern. Swiftsure and 82mm long. The second model is a Swiftsure class Battleship which was number 2 in the Minifigs list. This is the die cast equivalent and features a B2 on the stern. I was fortunate enough to acquire a pair of these at my local Toy and Train Fair. B3 or the rather imposing King Edward VII - note the 9.2" at either end of the central superstructure. She is 82mm long. The next model is of a King Edward VII class battleship and this particular ship was not available from Minifigs. Again, this is a die cast model with the number B3 on the stern. This one came from Ebay and cost me a mere 99p! At the time of writing I have Majestic class Battleship en route from the USA (Minifigs list number 3) and so I hope to add this to the collection as a possible candidate for recasting. I really want to get hold of a Minifigs Number 6 - a Canopus class battleship as this is the most generic looking example of a battleship for the whole period and so would serve as many different classes of ship. I would guess that its popularity for this very reason is probably why I am unable to find one! Minifigs No.7 is the cruiser HMS Drake and with a little imagination could easily be used as a Cressy or even a Diadem class cruiser without too much difficulty. Minifigs No. 8 is a Devonshire class cruiser. She comes in at 81mm long. Minifigs No. 13 is a Highflyer or Arrogant class cruiser although is described on the list as an 'Early Turret Battleship'. She is 69mm in length. The next selection of models are all destroyer or torpedo boat types and to be honest, I have not attempted to match them with their historical counterparts yet. They seem fairly representative of the myriad types the RN had on the go during the 1895 to 1905 period and needless to say, 'turtlebacks' feature quite prominently. There are even a couple of submarines in the collection - as well as a single example of merchantman. At the time of writing I am very keen to acquire the aforementioned HMS Canopus (No. 6) and also Minifigs No. 14 which is described on the list as an 'Early Turret battleship' but is in fact an Edgar class cruiser which could also be used for a Blake class. The models above are very basic in terms of detail for sure and would certainly not win any prizes in terms of accuracy BUT as gaming pieces indicative of the type and with a little work could be turned into something pretty respectable looking. The models originally were cast with masts etc in place but sadly none of these have survived and so I will clean up the stump prior to casting. In fact the models all need a little cleaning up in respect of flash etc but it is hardly a major undertaking. I suppose these ships can best be described as 'Marmite Models' because you will either love them or you will hate them. For my part I love them and so will press on to see about making these models available to the naval war gaming fraternity once again. A very odd looking battlefield but you get the gist of it! The missing pieces arrived this morning and so phase one of my Hexon accumulation is now complete. I have the hills, roads and rivers I need and anything else will be acquired on an as and when basis. There is a sufficient quantity and selection of types for most of the ideas I have and was purchased with the a standard Command and Colours sized set up in mind - 13 x 9 hexes. I am really pleased to have finally landed this lot and the plans for the inaugural game can now proceed, hopefully at the weekend. Ho-hum. I would like to say it could only happen to me but I suspect I am neither the first nor the last to have done this. I placed my order with Kallistra for my Hexon terrain pieces over a week ago and the package duly arrived yesterday morning. It is really nice and I am delighted to have taken the plunge with the collection and am looking forward to using the same for my gaming adventures. The order was made up of a selection of flocked hills, roads and stream sections in what I thought would be a suitable varied selection for creating any number of battlefields. Picture the scene if you will. There I was parked in front of my PC constructing the order and yes, you've guessed it, going through various permutations of what the final order will look like. In a nutshell, what I had ordered was not what I thought I had ordered. I should have checked the end result more carefully but failed to do so and am now down one pack of stream sections as a result!